Social surveillance and regulation of knowledge will be one of the most important issues in the near future, one that will give rise to unending controversy. In The Governance of Knowledge, Nico Stehr predicts that such concerns will create a new political field, namely, knowledge policy, which will entail regulating dissemination of the anticipated results of rapidly increasing knowledge. The number and range of institutionalized standards for monitoring new knowledge has hitherto been relatively small. Only in cases of technological applications has social control, in the form of political regulation, so far intervened. All modern societies today have complex regulations and extensive concerns with the registration, licensing, testing, and monitoring of pharmaceutical products. The increasingly important and extensive area of intellectual property legislation and administration is an example of social control in which certain measures selectively determine the use of scientific finds and technical knowledge. 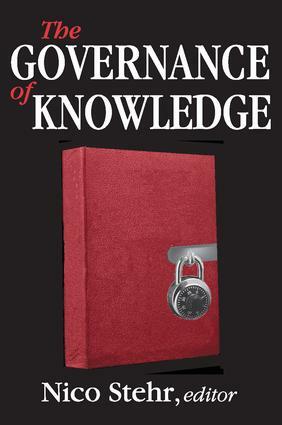 The Governance of Knowledge assembles a range of essays that attempt to explore the new field of knowledge politics for the first time. It is divided into four parts: The Emergence of Knowledge Politics: Origins, Context, and Consequences; Major Social Institutions and Knowledge Politics; Case Studies on the Governance of Knowledge; and Issues in Knowledge Politics as a New Political Field. Individual chapters concern the emergence of knowledge policy, the embeddedness of such regulations in major social institutions, and offer case studies of the governance of knowledge and discuss controversial issues that are bound to accompany efforts to regulate new knowledge. Professionals and graduate students in the fields of scoiology, political science, social science, and law, including policymakers and natural scientists, will find this book extremely informative.